It’s safe to say that Umni Song inspired us all today. She shared her views on the Asian American identity, her professional experiences, and broadened our perspectives on non-traditional career paths and opportunities. Growing up as a Korean American, Unmi often felt that others did not see her as an American because she didn’t look like one; she also received surprising comments about how well she could speak English. When she lived in South Korea, working for Gold Star Tele-Electric Company in Seoul, she also felt like an outsider. Even though she looks Korean, her limited Korean fluency made it difficult for natives to accept her as Korean. The anecdote on this topic is short, but it clearly reflects the world Asian Americans live in. While we may identify with a certain nationality and culture, it isn’t always aligned to the perception of those we encounter. Unmi began her career in the private sector, holding positions in Gold Star Tele-Electric Company in Seoul, the First National Bank of Chicago, Citicorp Investment Bank in New York City, and Bankers Trust Company. While she enjoyed the work and the perks, she noticed one day that there are many others who want her job more than she wants it. She began to think about what she really wants to do, what would make her truly happy, and where her passion is. She decided that her passion is in giving back, in making a difference to the world, and this is what launched her self-exploration and what led to her career switch into the nonprofit sector. Switching careers is not easy, especially when the switch is to completely unfamiliar and foreign ground. Unmi did not let that stop her, however. Instead, she spent a lot of time learning about the nonprofit sector through reading up on relevant literature and conducting informational interviews, talking to more than 100 people who work with and work in nonprofits. The information she collected helped her pinpoint where her skills and background could be applied and utilized in this different world. One of the helpful tips she gave was on informational interviews. Informational interviews are interviews that job seekers conduct to help them learn about a specific occupation or organization. These are useful in terms of networking and also in getting an insider’s view on the jobs and organizations. When requesting an informational interview, it’s important to state your purpose, to explain your skills and what you’re good at, and also to admit that there’s a lot you don’t know. When preparing for an informational interview, it’s helpful to think about questions that will guide you to your ultimate goal, for example: what can I do to be useful to the organization. With time, you’ll be able to refine your questions better to get relevant information, and eventually, your hard work will pay off, just like Unmi’s, when she landed her dream job. Twenty years later, she’s stayed at a job that other people still want, but this time, she wants it as much as everyone else does, if not more. Working for a nonprofit is a lot different than working in the private sector. In the finance world for example, a project can take a lot of time and energy and stress before it is complete, but when it’s done, it’s done. However, when you work for a nonprofit, your work is never done. There is always more to do. While not everyone can or is willing to switch careers to the nonprofit sector, Unmi encourages everyone to give back. 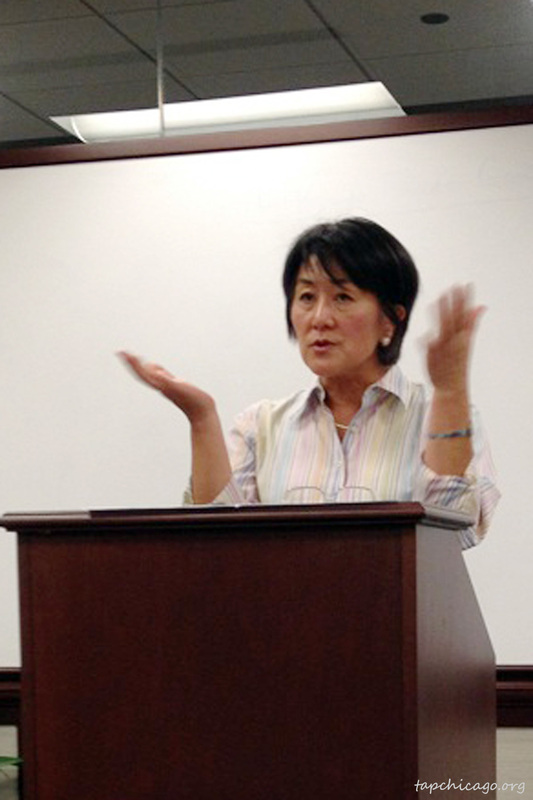 She says that Asian American Foundations receive less than 1% of donations. This may be because of the notion of Asians as model minorities– but Asian Americans need help, too. Whether it’s through community service or monetarily, we should all try to give back in ways we can. 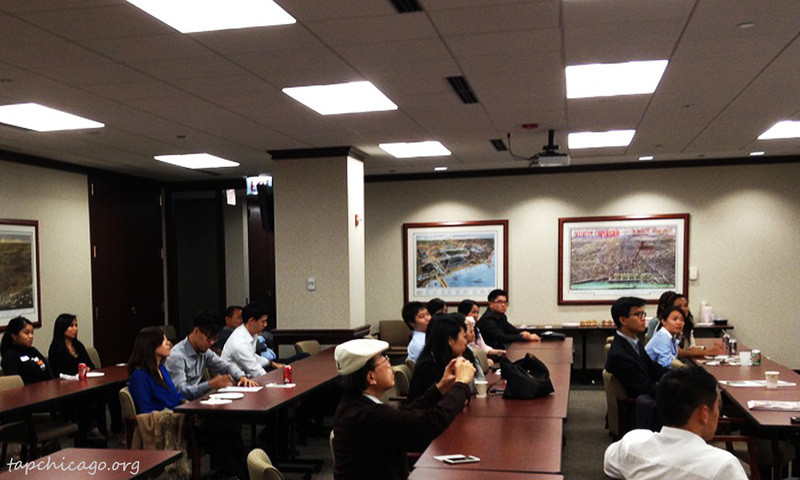 Special thanks to Jack and to the Asian Professional Network, who put together this event. We look forward to more successful professional development seminars such as this one! Posted in Professional and Leadership Development, Recap and tagged Asian American, Chicago, Community Service, Events, giving back, Korean, nonprofit, Professional Development, seminars, Taiwanese, TAP-Chicago. | permalink.